Book an exhilarating desert adventure with our professional team of desert drivers. 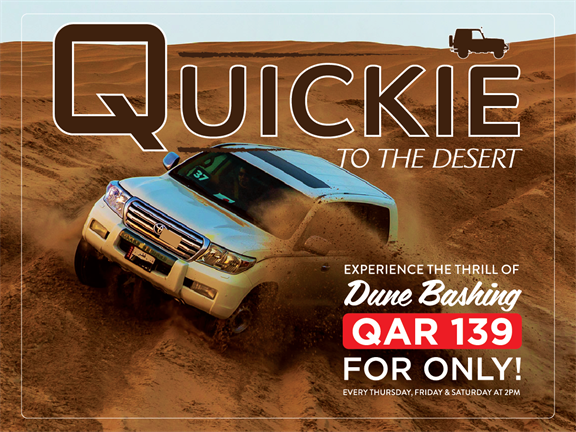 Enjoy a day out in the relaxing singing sand dunes of Mesaieed along with a thrilling dune bashing experience. This 4-hour getaway takes you all the way to the breath-taking inland sea a.k.a Khor Al Adaid where the opposite side is Saudi. We encounter three borders at this point i-e UAE, Saudi Arabia & Qatar. Discover this UNESCO recognized natural reserve with its own ecosystem; this is one of the few places in the world where the sea encroaches deep into the heart of the desert. - We suggest you bring snacks and a camera. For Inquiries please contact us at 3339 3323.